The special exhibition »Bewegt seit 1893. 125 Jahre VfB Stuttgart« at the Mercedes-Benz Museum showcases the rich history of the traditional club from Bad Cannstatt. 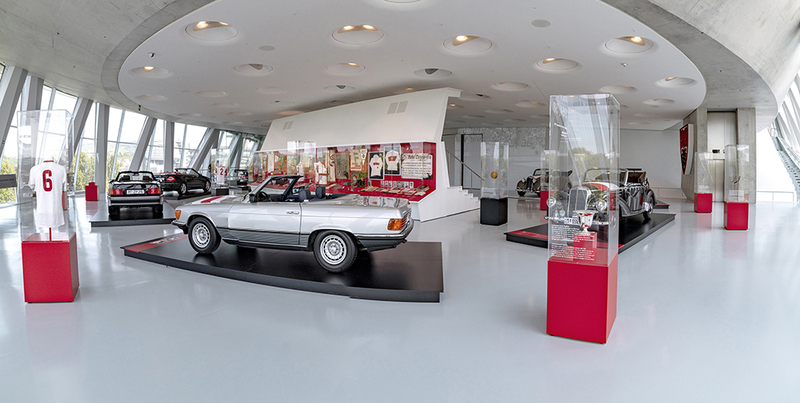 Unique exhibits and an elaborate spatial setup allow visitors to explore the team’s illustrious past and celebrate their passion for the »Red and White«. The eye-catching centrepiece of the exhibition is a stand fitted with original stadium seats. Guests sitting here can enjoy legendary plays and emotional magic moments from VfB’s 125-year history on a large-scale projection screen amid a stadium atmosphere. Selected Mercedes-Benz Museum vehicles form a procession through the exhibition, which offers a comprehensive chronology from 1893 to 2018. The vehicles used during the club’s most important moments represent historical highlights and corre-spond to selected contemporary historical objects. 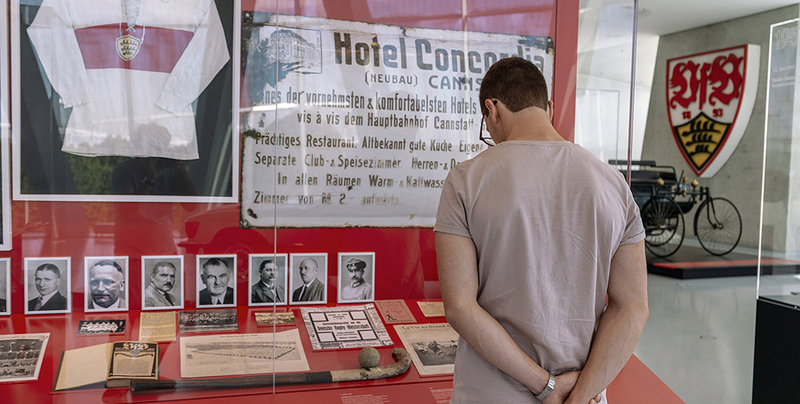 Eleven other key exhibits in individual display cases put a spotlight on the football players and further explore the team’s greatest triumphs and turning points. At the back of the stand, a variety of exhibits from the club’s 125-year history – some of which have never been available to the public before – are shown along 11 metres (the distance of a penalty kick) and are sure to get fans’ hearts racing. 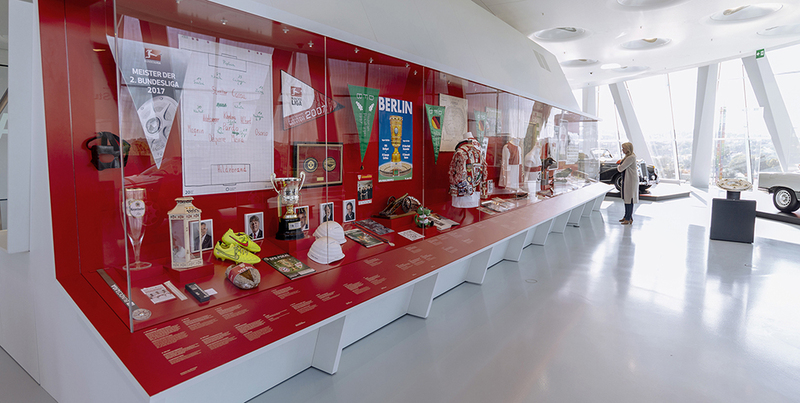 Football shirts, pennants, gifts from guests, photos and origi-nal documents from the VfB Stuttgart archive tell exciting stories and offer a behind-the-scenes look at the moving history of the »Verein für Bewegungsspiele«. The unobstructed view of the Mercedes-Benz stadium from the museum rounds off the visitor experi-ence. 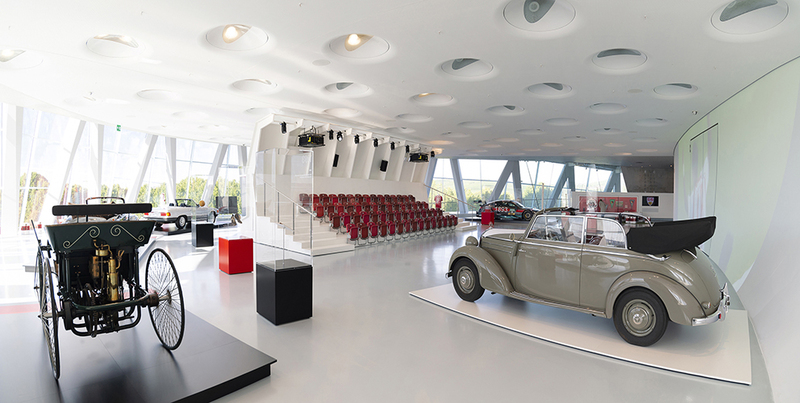 It extends the visitors’ perspective beyond the walls of the exhibition space, representing the VfB’s historical and current venues and alluding to the successful, longstanding partnership between VfB and Mercedes-Benz.